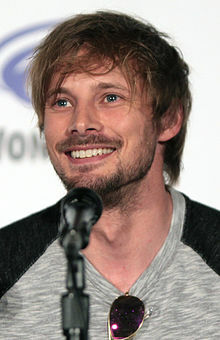 For other people named Bradley James, see Bradley James (disambiguation). Bradley James (born 11 October 1983) is an English actor best known for portraying Arthur Pendragon in the BBC TV series Merlin. James was born in Exeter, Devon, England. He and his family then moved to Jacksonville, Florida, in the United States when he was nine. During his time there, he attended elementary and middle school, before returning to England to attend Madeley High School in Madeley, England. James first appeared in an episode of Lewis in 2008 and also played the part of Ben Davis in the BBC Three comedy-drama film Dis/Connected. His breakthrough came in 2008 when he was cast as Prince Arthur, who later becomes the legendary King Arthur, in the BBC One fantasy TV series Merlin. The show was a consistent hit series in the US; its first season was shown on the broadcast network NBC and its second, third, fourth, and fifth seasons on NBC's affiliate cable network Syfy. Merlin ended its 5-year run in 2012. James and co-star Colin Morgan went on an exploration of Arthurian legends for BBC Wales, The Real Merlin & Arthur, in 2009. James also guest-starred as Edgar in the fourth season of the Emmy Award winning political thriller television series Homeland in 2014. In 2015, James was cast as a villain in Underworld: Blood Wars. The same year, he appeared in the television series iZombie as recurring character Lowell Tracey, a love interest for main character Liv. He starred as title character Damien Thorn on television series Damien, a sequel to the Omen film series. The show debuted in March 2016 but was cancelled after one season. 2008 Lewis Jack Roth "Music to Die For"
2009 Children in Need Arthur "1.30"
2014 Homeland J.G. Edgars "The Drone Queen"
^ "Bradley James". TVGuide.com. Retrieved 2017-09-07. ^ "Syfy's 'Merlin' star has Jacksonville connections". ^ "Merlin to cast final spell as creators reveal that current series will be the last". 26 November 2012. Retrieved 26 November 2012. ^ "The Real Merlin and Arthur". BBC. Retrieved 4 January 2013. ^ "Bradley James Credited w/Role in 'Homeland' Season 4". 18 June 2014. Archived from the original on 25 December 2015. Retrieved 19 June 2014. ^ Fleming Jr., Mike (9 September 2015). "Bradley James Lands 'Underworld 5' Villain Role". Deadline. Retrieved 10 September 2015. ^ Saclao, Christian (23 July 2015). "'iZombie' Creators Regret Killing Off Bradley James' Lowell?". Design & Trend. Archived from the original on 15 December 2016. Retrieved 6 January 2016. ^ "This is First Lieutenant Tom Dunbar of the U.S.Army Air Force & he won't be leaving a tip for the service". Bradley James' Instagram. Retrieved 26 January 2019. ^ "BBC THREE:Dis/Connected". BBC Three. Retrieved 18 April 2015. ^ Webb, Claire (5 October 2012). 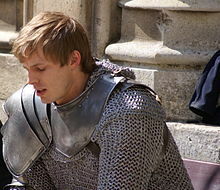 "Bradley James: "Merlin has grown up. We've grown up"". Radio Times. Retrieved 18 April 2015. ^ Dussander, Joe (4 January 2013). "MERLIN'S BRADLEY JAMES SAYS NO TO MOVIE AND SPIN-OFF". ScifiNow. Retrieved 18 April 2015. ^ "Wait... wut? Merlin's Bradley James is in Homeland and we missed it". Digital Spy. 21 July 2014. Retrieved 17 April 2015. ^ "Bradley James from 'Merlin' guest stars on 'iZombie' season 1, episode 5". Hypable. 14 April 2015. Retrieved 17 April 2015. ^ Harris, Jamie (4 December 2014). "Merlin's Bradley James to star in The Omen TV sequel Damien". Digital Spy. Retrieved 17 April 2015. ^ "Bounty Hunters (TV Series 2017– )". IMDb. ^ Andreeva, Nellie (22 January 2019). "'The Liberator': Bradley James To Star In Netflix's Animated World War II Drama Series". Deadline. Retrieved 26 January 2019. Wikimedia Commons has media related to Bradley James. This page was last edited on 3 March 2019, at 01:24 (UTC).